The Misfits is a 1961 American drama film written by Arthur Miller, directed by John Huston, and starring Clark Gable, Marilyn Monroe and Montgomery Clift. The supporting cast features Thelma Ritter, Eli Wallach and Kevin McCarthy. It marked the last completed film of Gable and Monroe. For Gable, the film was posthumously released, while Monroe died the following year. The plot centers on a recently divorced woman (Monroe) and her time spent with a cowboy (Gable) and his rodeo-riding friend (Clift) in the Western Nevada desert in the 1960s. The film was a commercial failure at the time of its release, but received positive critical comments for its script and performances, and is highly regarded today. In Reno, Nevada, Roslyn Tabor (Monroe) is a 30-year-old woman who has just gotten a quickie 6 week divorce from her inattentive husband Raymond (McCarthy). After leaving the Washoe County Courthouse, Roslyn's best local friend, Isabelle Steers, (Ritter) takes her to a bar at Harrah's Reno for drinks to let the reality of her divorce sink in. While there, they meet an aging cowboy named Gaylord 'Gay' Langland (Gable) and his tow truck driver friend Guido (Wallach). They invite Roslyn and Isabelle to Guido's place in the Nevada country to help her forget about the divorce, after Gay tells Roslyn that he is also divorced. They arrive at the unfinished house Guido built for his late wife, who died several years earlier during childbirth. They drink and dance. Roslyn has too much to drink, so Gay drives her home to Reno. Eventually, Roslyn and Gay move into Guido's half-finished house and start to work on it. One day after breakfast, Gay tells Roslyn how he wishes he were more of a father to his own children, whom he has not seen for some years. Later that afternoon, Roslyn and Gay argue when Gay states his intention to find and kill the rabbits which have been eating the vegetable garden they planted outside Guido's house. When Guido and Isabelle later show up at the house, Gay suggests that they round up wild mustangs to sell. They plan to go to a local rodeo in Dayton to hire a third man for the job. Along the way, they meet Perce Howland (Clift), a friend of Gay's who is also on his way to the Dayton rodeo to compete. Gay offers to pay for the broke Perce's $10 rodeo entry fee if he helps the group round up wild mustangs for slaughter afterward. Isabelle sees her ex-husband Charles and his new wife Clara, and decides to invite them to her home instead of going to the rodeo with Gay, Guido, Perce, and Roslyn. Before the rodeo, Guido, Perce, Roslyn and Gaylord all drink heavily at a Dayton bar, where wagers were made and won on Roslyn's ability to play a game of paddle ball. The group is nearly involved in a fist fight when another patron at the bar spanks Roslyn's bottom. At the rodeo, Roslyn becomes somewhat upset when Guido tells her how the horses are made to buck with an irritating flank strap. She declares that all rodeos should be banned. Later, Perce is thrown by a bucking horse and Roslyn begs him to go to a hospital, but he insists on riding a bull he had already signed up and paid to ride. He gets thrown again, resulting in a head injury. Later, after Roslyn dances with Perce, he passes out in a back alley. When he regains consciousness, he sees her crying over him. He says that he never had anyone cry for him before and that he wished he had a friend to talk to. He tells her how his mother changed after his father died, giving his stepfather the ranch Perce's father wanted to leave to Perce. A drunken Gay then fetches Roslyn, telling her that he wants her to meet his kids, whom he claims he unexpectedly ran into. When Gay discovers his children have already left, he causes a public scene. Later on, during the drive home to Reno, a drunken Guido asks if Roslyn has left Gay and offers to take his place. Back at Guido's house, Guido, intoxicated and sleepless, attempts to finish the patio he started. Perce awakens and nearly tears his bandages off, forgetting about his recent injury. Roslyn puts him to bed and sits down with Gay. He asks her if a woman like her would ever want to have a child with him. She avoids the issue, and Gay goes to bed. The next day, Gay, Guido and Perce prepare to go after the mustangs, and Roslyn reluctantly tags along. After they catch a stallion and four mares, Rosalyn becomes upset when she learns that the mustangs will be sold for dog food. She then tells Gay she did not know she was falling in love with a killer. He tells her that he did things for her that he never did for any other woman, such as making the house a home and planting the garden. After the horses are captured, Roslyn begs Gay to release the horses. He considers doing it, but when she offers to pay $200, it angers him. Guido tells Roslyn that he would let them go if she would leave Gay for him. She rebuffs him, rightly telling him he only cares about himself. Perce also asks her if she wants him to set the horses free, but she declines because she thinks it would only start a fight. He frees the stallion anyway. After Gay chases down and subdues the horse all by himself, he lets it go and says he just did not want anybody making up his mind for him. They get into Gay's truck. As they're driving Roslyn tells Gay that she will leave the next day. Gay stops the truck to pick up his dog, and watches Roslyn joyfully untethering it. Gay and Roslyn realize that they still love each other, and drive off into the night. John Huston appeared as an uncredited extra in the blackjack scene. The making of The Misfits was troublesome on several accounts, not the least of which was the sometimes 108 degrees (42 °C) heat of the northern Nevada desert and the breakdown of Monroe's marriage to writer Arthur Miller. Miller revised the script throughout the shoot as the concepts of the film developed. Director Huston gambled and drank, and occasionally fell asleep on the set. The production company had to cover some of his gambling losses. In a documentary about the making of The Misfits, Wallach told a story of Huston's directing a scene in which Wallach was at a bar with Gable. Huston told him that the most intoxicated he had ever been was the day before, even though he had seemed sober. Huston's lover, Marietta Peabody Tree, had an uncredited part. Mr. Huston got involved in other local Nevada activities outside gaming, including promoting the first annual Virginia City camel races—which have continued annually every September to this day. Huston's car overheated on the drive up to Virginia City via Hwy 341 Geiger Grade, and Huston "executed" the car by reportedly firing a stunt gun blank into the radiator. Meanwhile, while her marriage crumbled, Marilyn Monroe was sinking further into alcohol and prescription drug abuse; according to Huston in a 1981 retrospective interview, he was "absolutely certain that she was doomed" while working on the film: "There was evidence right before me every day. She was incapable of rescuing herself or of being rescued by anyone else. And it affected her work. We had to stop the picture while she went to a hospital for two weeks." 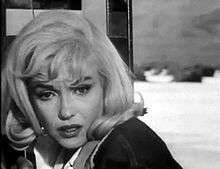 Huston shut down production in August 1960 to send Monroe to a hospital for detox. Close-ups after her release were shot using soft focus. Monroe was nearly always late to the set, sometimes not showing up at all. She spent her nights learning lines with drama coach Paula Strasberg. Monroe's confidant and masseur, Ralph Roberts, was cast as an ambulance attendant in the film's rodeo scene. Gable insisted on doing some of his own stunts, including being dragged 400 feet (120 m) across the dry lake bed at more than 30 miles per hour (48 km/h). Veteran Western actor Rex Bell (who was married to Clara Bow) made his final film appearance in a brief cameo as a cowboy. Bell was Lieutenant Governor of Nevada at the time. Thomas B. Allen was assigned to create drawings of the film as it was made. Magnum Photos had staff photographers, including Inge Morath and Eve Arnold, assigned to document the making of The Misfits. Morath later married Miller, Monroe's former husband, soon after the film was released. During production, the cast's principals stayed at the now imploded Mapes Hotel in Reno. Film locations included the Washoe County Court House on Virginia Street and Quail Canyon, near Pyramid Lake. The bar scene wherein Monroe plays paddle ball and the rodeo scenes were filmed in Dayton, Nevada, east of Carson City. The climax of the film takes place during wrangling scenes on a Nevada dry lake 12 miles east of Dayton, near Stagecoach. The area today is known as "Misfits Flat". Filming was completed on November 4, 1960, 12 days before Gable's death, and The Misfits was released on February 1, 1961, on what would have been Clark Gable's 60th birthday. Despite on-set difficulties, Gable, Monroe, Clift and Wallach delivered performances that modern critics consider superb. Many critics regard Gable's performance to be his finest, and Gable, after seeing the rough cuts, agreed. Monroe received the 1961 Golden Globe Award as "World Film Favorite" in March 1962, five months before her death. Directors Guild of America nominated Huston as best director. There were high expectations, given the star power of writer, director and actors. Producer Frank E. Taylor had heralded The Misfits as "the ultimate motion picture" before its release. The Misfits was met with mixed reviews and failed to meet expectations at the box office, and has been historically referred to as a "box office disaster" of its day. Despite being shot in black and white, the final cost was about $4 million. Its original domestic gross was just over its estimated budget of $4,000,000, making $4,100,000 in its initial USA release. It has brought larger profits to United Artists since its release on DVD. The film has a 100% on the film-critics aggregate site Rotten Tomatoes, based on 13 latter-day reviews. Gable suffered a heart attack two days after filming ended and died ten days later, November 16, 1960. Monroe and Clift attended the premiere in New York in February 1961, while Arthur Miller attended with his two children. Monroe later said that she hated the film and her performance in it. Within a year and a half, she was dead of an apparent drug overdose. The Misfits was the last completed film for both Monroe and Gable, her childhood screen idol. As a child, Monroe had often claimed that Gable was her father. The documentary The Legend of Marilyn Monroe (1966) includes footage shot while The Misfits was being made. Miller's autobiography, Timebends (1987), described the making of the film. The 2001 PBS documentary, Making The Misfits, did the same. Primary sources such as The Making of the Misfits by James Goode, Conversations with Marilyn by W. J. Weatherby, and Miller's account, particularly his assertion that The Misfits script was a "valentine" for Monroe, inspired the docu-drama play Misfits by Alex Finlayson, which was commissioned by director Greg Hersov. Misfits premiered at The Royal Exchange Theatre, Manchester in 1996, directed by Hersov and starring Lisa Eichhorn as Marilyn Monroe. Arthur Miller's last play, Finishing the Picture (2004), although fiction, was largely based on the events involved in the making of The Misfits. The Misfits was released to DVD by MGM Home Video on May 8, 2012 as a Region 1 widescreen DVD and on May 10, 2011 on Blu-ray DVD. ↑ "THE MISFITS (A)". United Artists. British Board of Film Classification. February 9, 1961. Retrieved August 19, 2013. ↑ Arthur Miller (1995). Timebends: A Life. Penguin. p. 470. ISBN 978-0-14-024917-0. 1 2 3 Greenberg, Peter S. "Saints and Stinkers". Rolling Stone (Interview) (337). Interview with John Huston. p. 25. 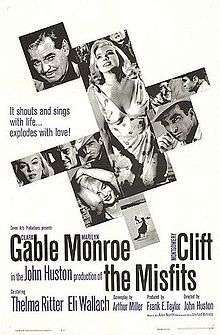 1 2 "Sunday Editor's Pick: The Misfits (1961)". AltScreen. 16 July 2011. Retrieved 15 February 2012. 1 2 James Goode (1986) [First Published 1963 as "The Story of The Misfits"]. The Making of the Misfits. Limelight Editions. p. 55,123. ISBN 0-87910-065-6. ↑ "Misfits Flat". Geographic Names Information System. United States Geological Survey. Retrieved 2010-04-17. ↑ "Behind the Camera: The Misfits". Retrieved 2014-04-12. ↑ Miller, Arthur (1987). Timebends. New York: Grove Press. p. 485. ISBN 0-8021-0015-5. ↑ Finlayson, Alex. Plays. Oberon Books. London, 1996. Wikimedia Commons has media related to The Misfits (film).